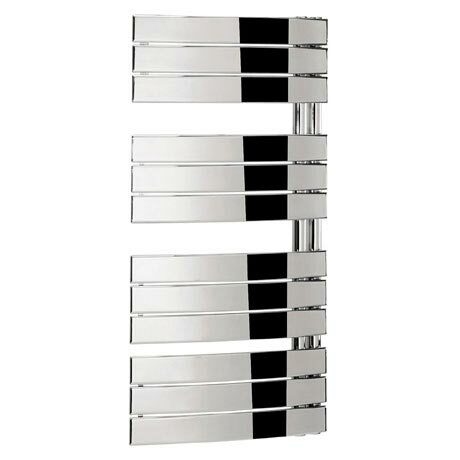 From angular lines to organic curves, choose from a wide range of the highest quality towel rails. Displaying exceptional form that’s extremely functional, the range features generous heat outputs to suit all bathrooms. Exuding Italian design, styles have been selected to coordinate with all Bauhaus furniture. Choose from striking finishes and varying sizes, all with plentiful room for towels. The Essence range has rectangular bars featuring a delicate curve form simultaneous sets of three for a sleek statement towel rail that’s equally practical. Available in two sizes in either Chrome or a dark grey Anthracite finish. Hi, the Output is 2889 BTU / 846 watts. Hope this helps! 2 out of 3 found this question helpful.